Get excited!! It’s a true original from The Half-Crunchy Mama. 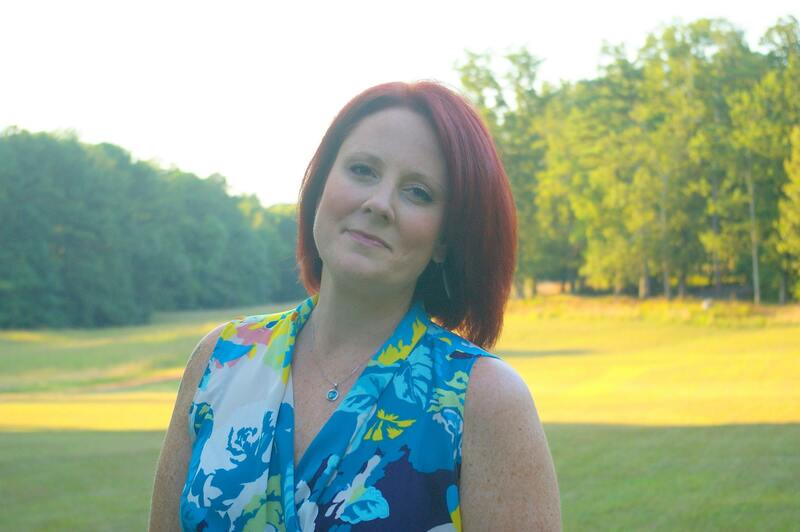 I apologize to my readers (especially my Facebook fans that knew about this for a few weeks) for taking so long with this post. Back-to-back weddings, a few weeks with Sugar Bee out of summer camp, and my job workload has left me with about a dozen drafted posts that aren’t close to publication time. But hey, I’m finally getting this one out to you! Better late than never and I think you will find it was worth the wait. 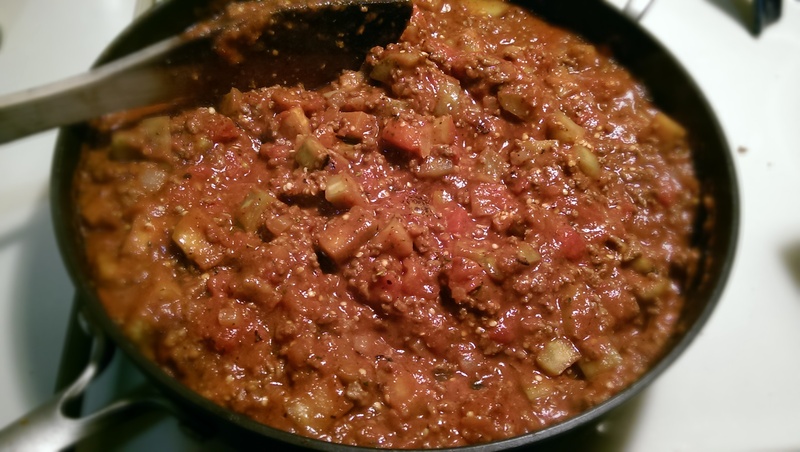 I have varied my eggplant ragout so many times through the years. For this particular batch, I worked with what I had in the house. You can switch up the spices, add some red wine, use sauce from a jar, improvise! That’s what I’m always doing in the kitchen. About 95% of the time that I make this dish, it gets served over oven-roasted spaghetti squash. 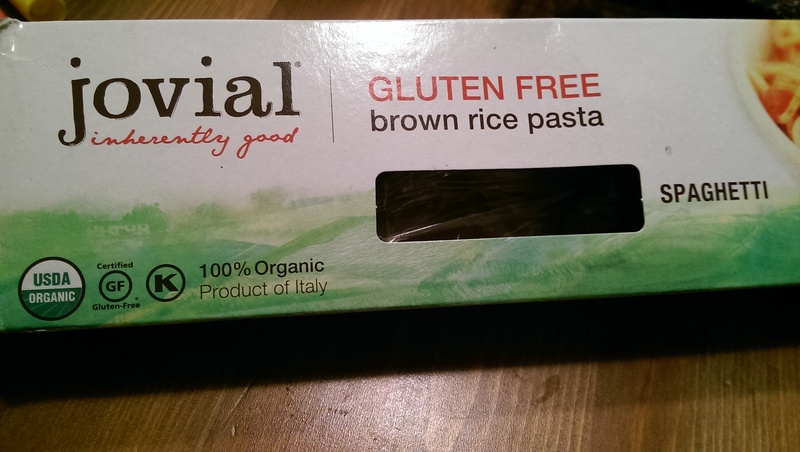 I couldn’t find one in Kroger and was in no mood to go to another store that evening, so I went with a gluten-free pasta. I kind of prefer it on the squash, but it will be just as delicious served over any pasta you choose (but I would go for the squash). There are a lot of things that you can do to make this your own. Hopefully, it will still look similar to this in the pan when it’s finished and ready to fill your belly. 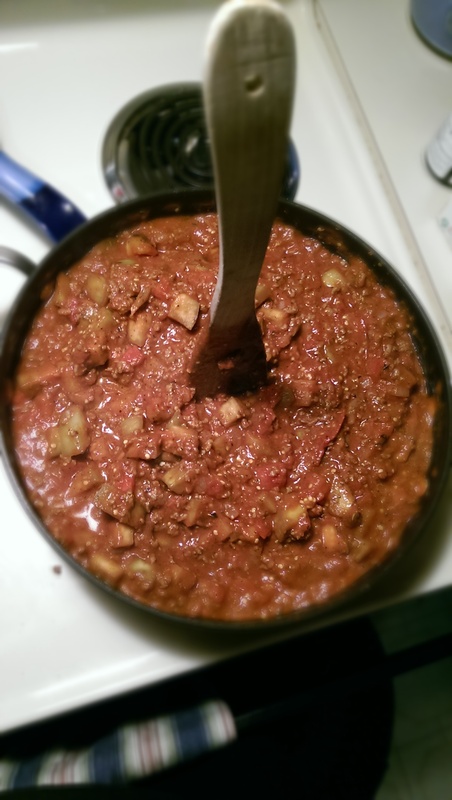 The most exciting part of making my ragout this time around was that it was made with two freshly grown eggplants picked right from my very own container garden. #humblebrag One large one would probably be enough. Feel free to adjust the quantity of both the beef and the eggplant based on the ratio that you want to have in your sauce. 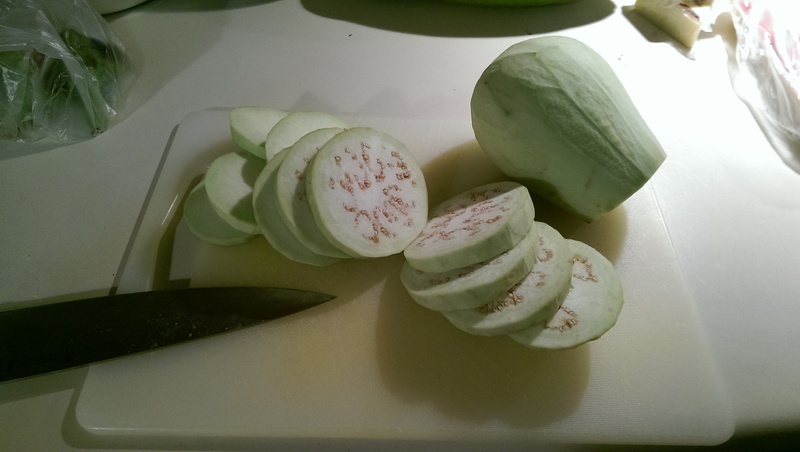 Peel, slice, and dice the eggplant. Dice it even smaller than this. I left them a little too big this time (about 1/2 inch dice), but it worked good for the photos 🙂 Put the diced eggplant in a bowl lined with paper towels, tossing with salt as you add to the bowl. It’s time to get the eggplant to sweat. Let the salted eggplant sweat it out in the bowl while you prep the other ingredients. It should be nice and glistening with visible water droplets before it gets thrown into the pan. Chop and dice an onion. If you somehow missed this tutorial on the interwebs, it will forever change the way you cut onions. 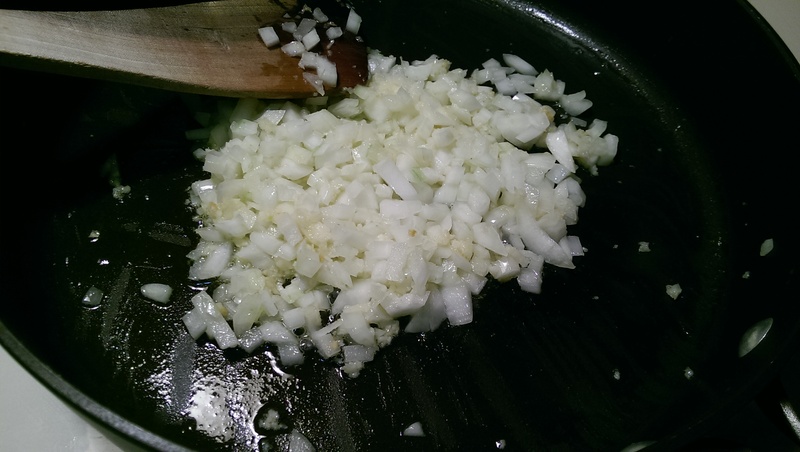 Next, mince up about 5 cloves of garlic….more or less depending on your taste. As I’ve said before, we love garlic in this house. Heat your oil in a deep saute pan over medium heat. Add the onions and garlic to the pan, and saute until the onions are just getting soft, but not browned. I LOVE the smell that fills that house from just this part alone. 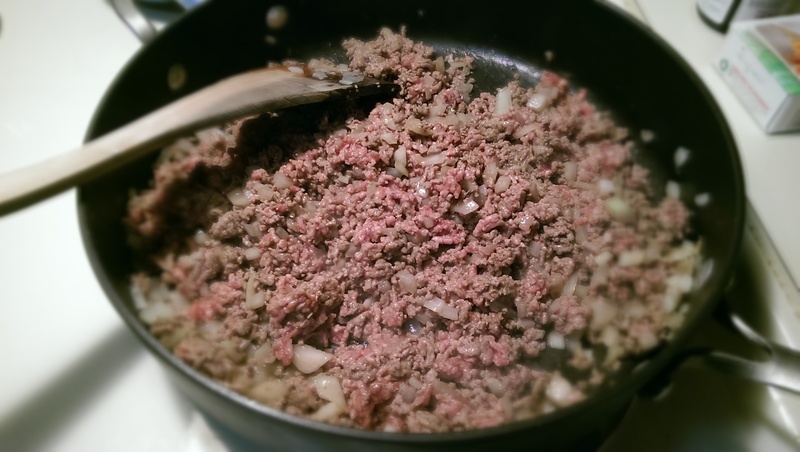 Throw a pound to a pound and a half of ground beef into the pan and combine, breaking it up. Add some Worcestershire sauce and/or red wine. Yes, I use the “unclean” Worstey sauce on just about anything beefy or pretending to be beef (like ground turkey). I love the flavor. And I love wine which is why it’s often included in any meaty saucy concoction, but I actually didn’t have any red wine in the house. WHAT?! Hard to believe, I know, and a shame that I didn’t have any to go along with cooking my ragout. I knew something was missing. While the meat is still a little pink, add your (hopefully) very sweaty eggplant to the pan. Add the fire-roasted, diced tomatoes, tomato puree, tomato paste, and all the spices. Taste a little of the liquid and add salt and pepper according to your taste buds. I can’t tell you how much to add because I don’t use much salt. Start with maybe 1 teaspoon of salt and several turns around the pan with the pepper grinder and taste it again. Continue until you like the flavor. You will know it’s ready to simmer when it’s ridiculously thick and you can stand a utensil up in it. Cover and simmer the sauce until the eggplant basically turns to mush. When you think that it’s getting close to being finished, get going on the pasta. If you are roasting spaghetti squash like I usually do, you should be about ready to take it out of the oven if it’s not already cooling off to get spaghettied. 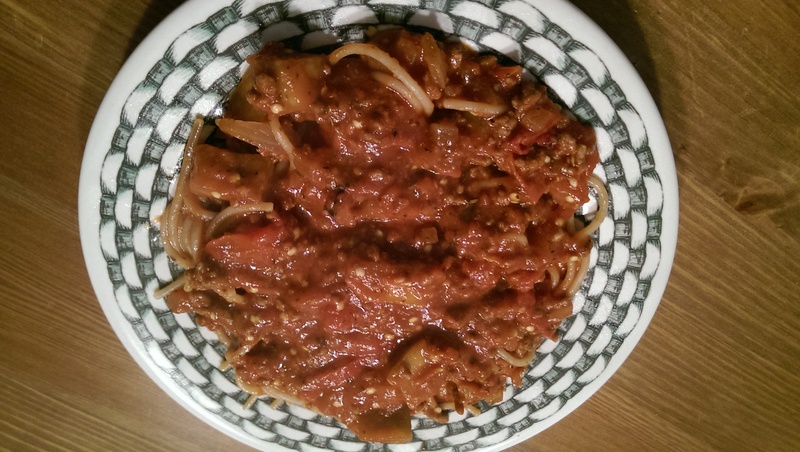 Gluten-free spaghetti made in Italy? Well surely this must be tasty. After all, Italians know their pasta! I cooked it up and I must give it a RAVE review. I have tried almost every brand of GF pasta on the market and can tell you what tastes “real” and what to avoid unless you are going to eat it all right away (no leftovers). Not only did this taste amazing, but it reheats beautifully. Six thumbs up from this household! 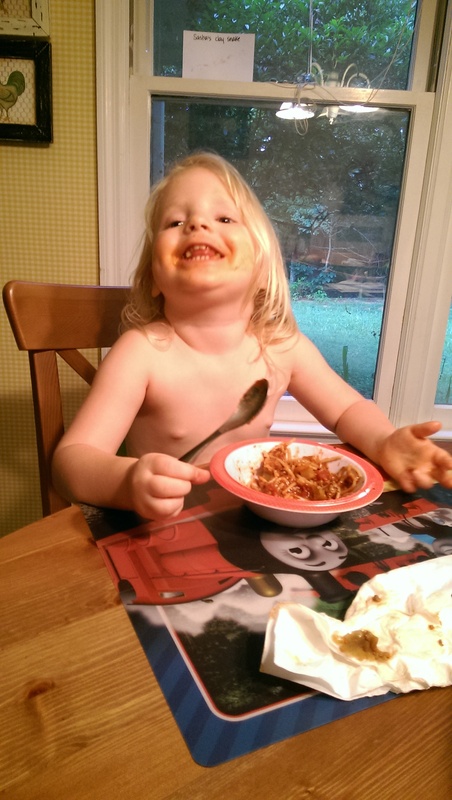 After finishing the pasta (or making spaghetti out of the squash), it’s time to eat! This was the plate I made up for Sugar Bee. Of course mine needed cheese. 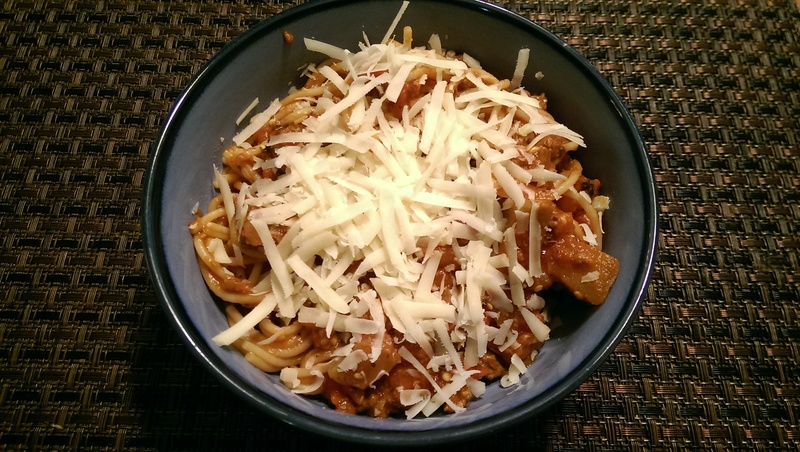 Fresh shredded Parmesan-Reggiano….yum. As usual, Sugar Bee approves! Be sure to dice the eggplant very small or it will take a long time for them to soften. You could also leave the meat out and double the eggplant for a vegetarian meal. 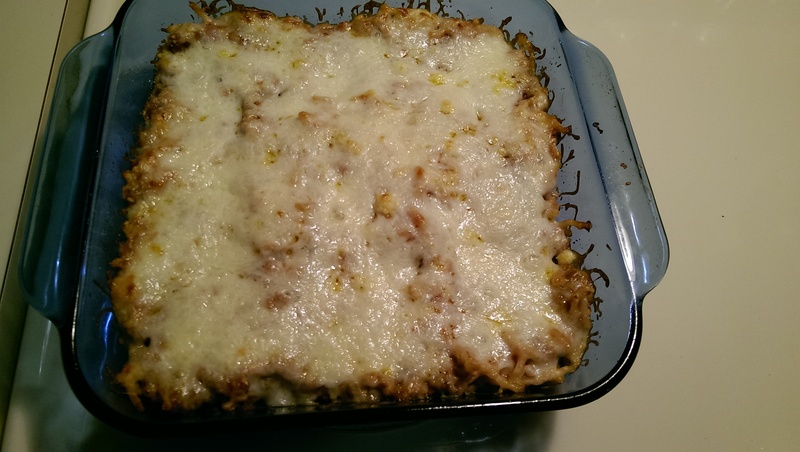 If you prefer to make a casserole or want an idea for what to do with the leftovers, scroll down past the recipe details for a cheesy transformation! 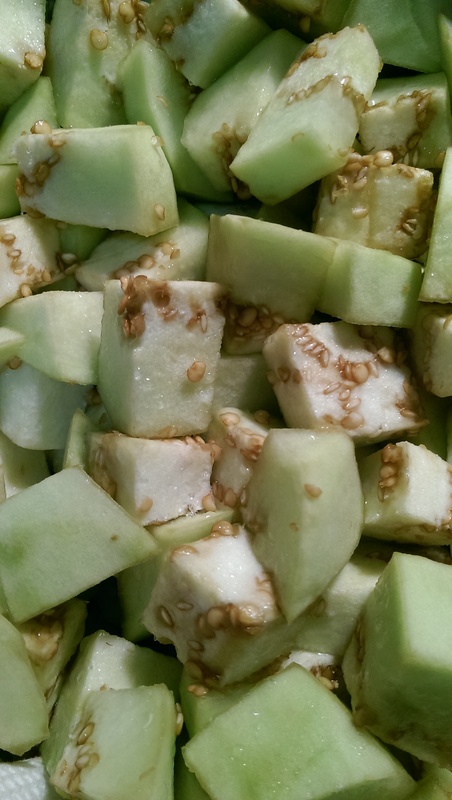 Sprinkle peeled and diced eggplant with salt while adding it to a bowl lined with paper towels. Set aside to sweat. Heat oil (a few turns around the pan) in a deep saute pan over medium heat. Add the onions and garlic and cook until the onions start to get soft, but not brown. 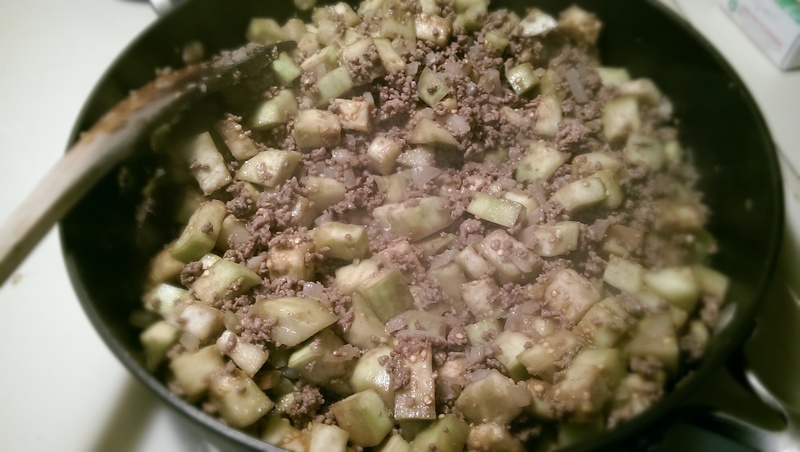 Add ground beef and Worcestershire/wine, and mix well to combine. When the beef is still slightly pink, add the eggplant, fresh ground pepper, and drizzle a few tablespoons of EVOO all over the eggplant. Increase heat to medium-high and cook, stirring often, for 5-8 minutes until eggplant begins to soften. Add tomatoes, puree, paste, and spices, and add salt and pepper to taste. (Taste a few times.) 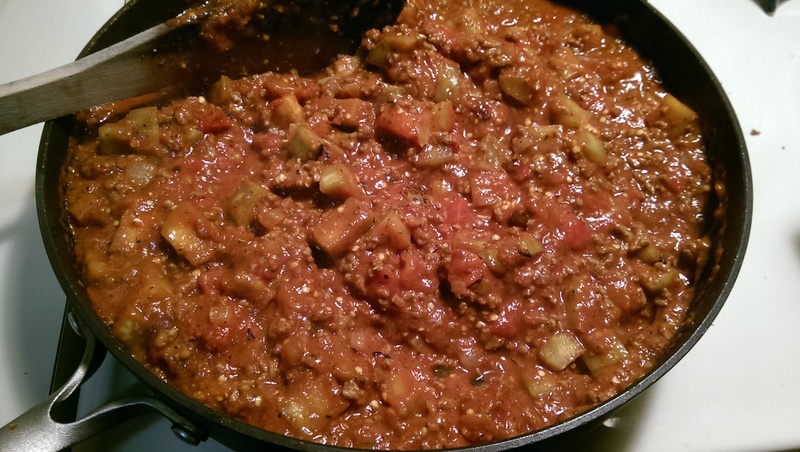 Reduce heat to medium-low, cover, and simmer until eggplant starts to get mushy. When the sauce is almost finished, cook pasta according to package directions or spaghetti the cooled roasted squash. Serve ragout over pasta and top with cheese, if desired. Enjoy! *Note: If using spaghetti squash, begin roasting it before making the sauce as it takes time to cook and will need to cool before handling. 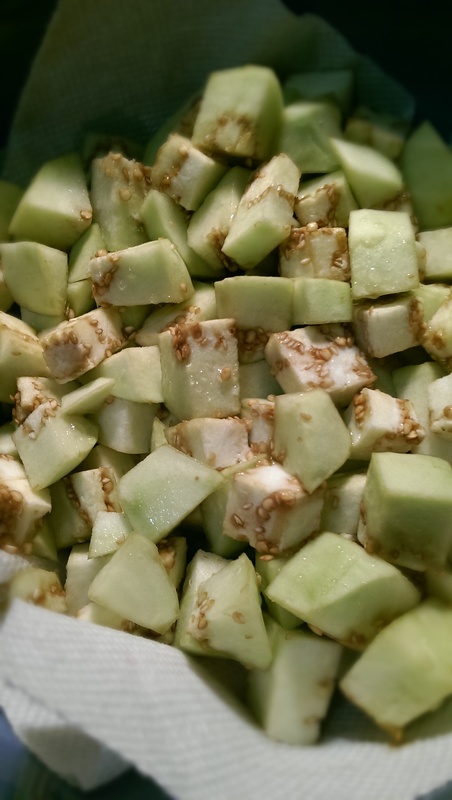 Here is a link to basic cooking methods. I cut in half, coat flesh with EVOO, and roast cut-side down in the oven at 375ºF for about 30 minutes, depending on size. When cool enough to handle, shred with a fork to make spaghetti-like strands. Leftovers? Or maybe you want it to be a casserole instead? Here’s a second meal you can make out of what is leftover or you can just continue here from where I ended the Ragout recipe. 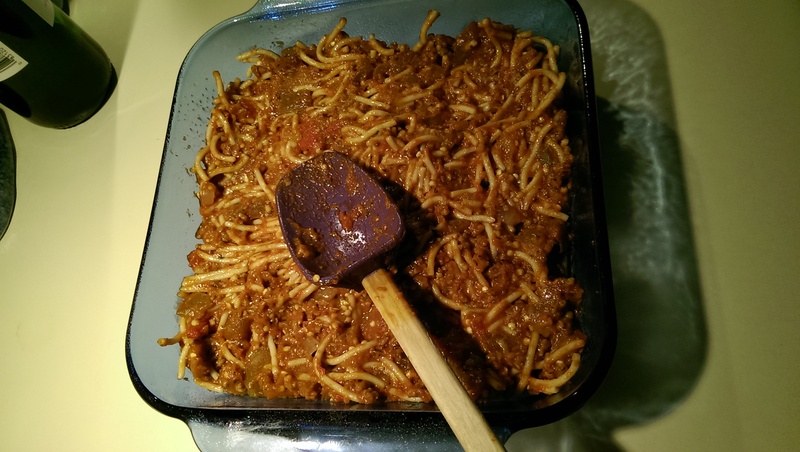 Combine pasta and ragout in the pasta pot or a large bowl. Add to glass baking dish (I used an 8×8-inch one for the leftovers) coated with cooking spray. Pat down with spatula or back of spoon to flatten. Add a layer of grated Parmesan cheese. 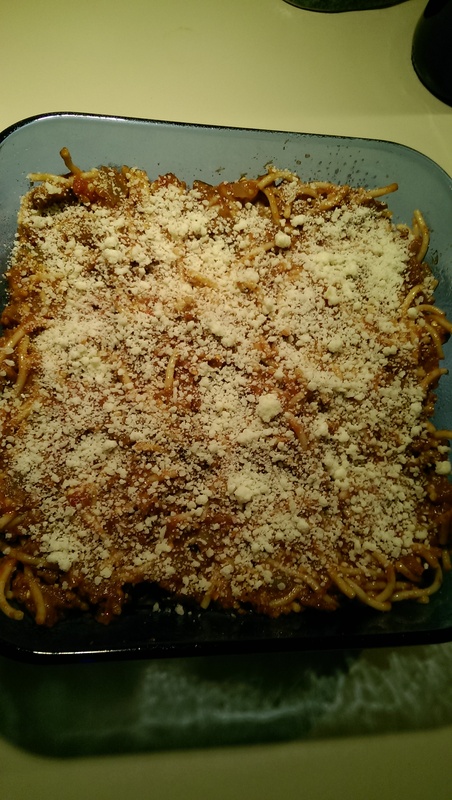 I use a grated Parmesan and Romano blend that I get from Trader Joe’s. 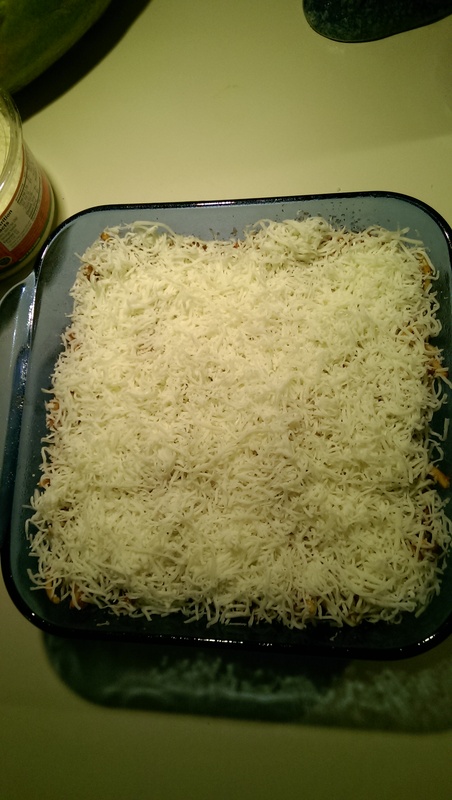 Cover with about one cup of shredded cheese. I like the Italian blend one from Publix, but regular shredded mozzarella would be just fine. 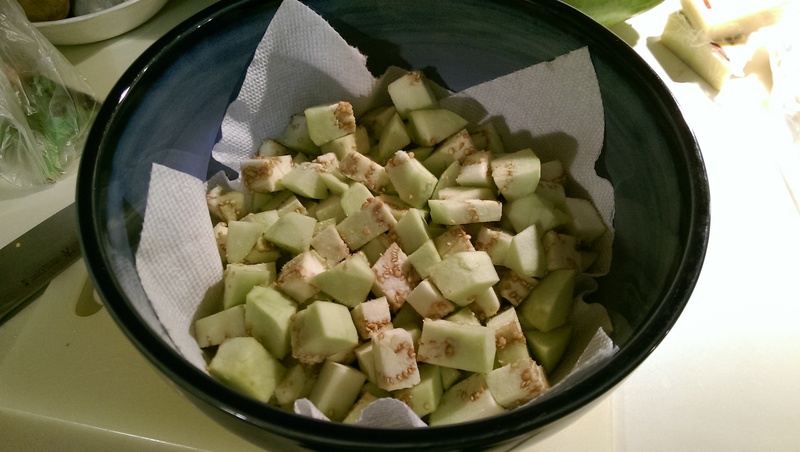 Place in preheated oven and bake at 325ºF for 15 minutes. Switch on the broiler for the last minute or two to brown the top. Now you have another meal! Categories: gluten-free, recipes, Uncategorized | Tags: budget-friendly, dairy-free, eggplant, gluten-free, healthy, leftovers, recipe | Permalink.